I think the pub at right center is the Bull & Butcher, 97 Watergate Street, Deptford ? for more information on the origin of Payne's Wharf. Brill..I knew this photo would cause some interest. I too was wondering what the ornate archway in the distance was but have not had the time to look at the maps etc. Glad to see your spot on with your knowledge of the area. I have a few more photos of Watergate and will post them shortly. I've looked at Payne's Wharf again and i think that it's pretty clear that the arch shown in your photograph survives in part. Both of the bases of the pillars appear to be intact up to the new c.1950's concrete lintel. The brick pillars appear not to be tied in to the rest of the building either and the brick and pointing alters on the Watergate elevation. Bomb damage occurred to this corner of the building and to the dockyard wall. Very interesting to add the information from your image to the understanding of the building. Thanks. I'm amazed there is still a footprint of the pillars there. Correct me if I'm wrong but was the the location of the structure just outside your gates at the start of what was once known as Butchers Row...right on the corner. Would be very interested to see some photos of your find if you have take any. 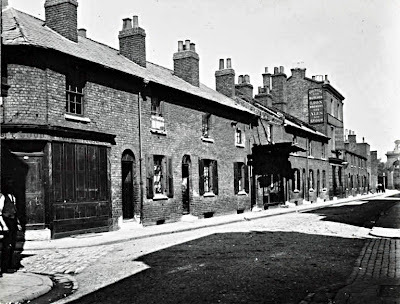 New to this site, so going to delve deep for more info, great photo and a real gem find for me as according to the 1891 Census my GGM lived at 85 Watergate Street which is two doors down from the Coffee House (#81) which is on the left of the photo (the PH is #97) so #85 is dead centre. Almost as if the photographer was taking a picture of that house! LOL. No. 17 Watergate Street, Deptford.